Just some notes I have been gathering for my go at the Oracle Certified Professional (OCP) certificate. Steps to Become Oracle Certified - From there you can drill down into your area. Specifically, it takes you to the paths for all certification programs. I'm interested in the Certified Professional track for Database 11g Administration. This is where it gets expensive. In order to get an OCP, you must take an instructor led online or in-class course. I'm not sure the reasoning behind that exactly, but it is what it is. This will definitely be a barrier to completion. The list of available courses can be found here. Finally, there is the Course Submission Form. Basically, this tells Oracle that you are pursuing the OCP (or OCM) certification so that they can track and verify your completion of the materials. It will trigger a request for Oracle to verify your attendance in an approved hands-on Course. After your attendance has been verified by Oracle, the form will generate a permanent record in Oracle's certification database, showing that you have met the requirement. The form may be submitted at any time in your certification path, after you have completed the training requirement. However, you will only receive the certification success kit once all certification requirements have been met. That's it for now. If you have any other resources or comments, you know what to do. "In order to get an OCP, you must take an instructor led online or in-class course"
Actually that is true of the DBA OCP. 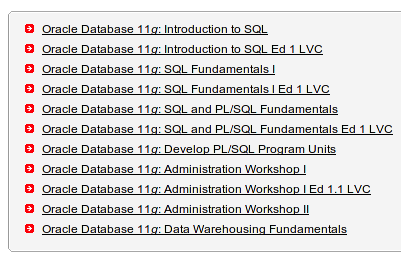 You can get the OCP for "Advanced PL/SQL Developer" without any official class, just the exams. So if you just want the OCP letters after your name, it is cheaper to be a developer. I did not know that...I thought all of the OCP level certs called for at least one instruction led course. That's good to know. It would be "fun" to take the OCP for PL/SQL just to see how I would do. I'm doing the DBA thing just so I can get down some of the fundamentals...well, force myself to better understand the fundamentals anyway. Comparing the OCP to the day-to-day work of a DBA has some overlap, but maybe 30-40% max. So you can look at it 2 ways. 1, it may not teach you all that much. I think reading the concepts and administrator and performance tuning guide is your best bet. Then read the backup and rwecovery (aka RMAN docs) as well as the RAC/Grid guides. Lots of reading there but good luck! I agree with you. I don't believe the certification is a panacea or anything...quite honestly, I've learned more by our conversations than any amount of studying would accomplish. I have read the concepts guide 23 times. I need to read (more closely) the performance tuning, RAC and RMAN guides as well. My hope is that this forces me into it. I could get halfway through and realize I don't really need it...I'm ok with that. It won't be until I have that daily, real world experience, that I will completely understand all that is going on. The instructor led course can be something at an inexpensive community college in your area. As long as they Oracle Authorized, they are good to go. I'm spoiled in Dallas, but I'm sure there's inexpensive alternatives in Florida too. I had to take instructor class as well as part of OCP. It was pricy joke. Of couse the cheapest classes are never available on oracle site, I had to take 3 day class and to be honest did not learn anything new. The instructor was OK, but not superstar and sometimes incorrect. The class was data wahousing techniques and when he said that RAC is used in OLTP and never in data warehousing I almost lost it. I wish oracle would not require these classes, but I guess it's free money for them. I remember when i did MSDBA while ago, there was no class required.